As a journalist, I get all manner of exciting things in the post. I’ve been sent bread (thanks, Warburtons), vodka (can’t remember…hic), myriad self-published books, and – once – a pair of paper knickers. 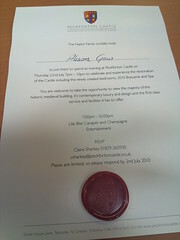 But this is possibly the most classy thing I’ve been sent – an invite to Peckforton Castle, in Cheshire, newly-reinvented as a spa. The paper was so thick it took ages to get it to lie flat for a photo. And look – it even comes complete with it’s own wax seal; I’d never seen a proper one before. And no, I’m not going.